The heat of the day was just reaching its peak as I drove the short distance through the lanes to the campsite where Kev was staying. We grinned at each other as I turned into the parking area – was this to be another memorable session? As expected for a sunny August bank holiday the roads were manic! But with the previous evening’s events the main topic of conversation, within minutes it seemed, we were parking the car and getting ready – sun cream, lots of water, hats, food, lures for day and night, and head torches were all stowed in our ruck sacks ready for the ¾ mile walk to the first mark. I had timed this session to commence just as the tide was beginning to turn (around 1600) and with the sun high in the sky, and the sea about as calm and clear as it can possibly get Kev made his first cast of the day with the lure of the moment – the Bear King Slim Skimmer. Kev was really enjoying using his newly purchased set up, commenting how easy it was to work the lures and effortlessly cast them to exactly where I wanted them – around 30m out into the increasingly fierce tide and beyond a submerged finger of rock running parallel to our stance. I’d just said to Kev that if the bass were going to show it would be in the next 15 minutes of not at all on this particular mark when (as per usual) just as I was having a quick drink, I saw a splash on the surface in addition to a shout from Kev – fish on! The bass did its best to head into the weed bed only a few centimetres under the water and situated between the finger of rock and us, but it was no match for the HTO Shore Game. Although the bass was under 2lb, it was a very pleasing start to proceedings and proof that bass can be caught in bright, settled conditions – looking for lots of tide/current when the sun is high in the sky is a common tactic of mine. A good start – Kev’s first bass of his second guided session with me smashed a surface lure 45 minutes into the flood. The next 30 minutes saw numerous swirls close to the lure but no positive attacks. Bass rarely miss a surface lure repeatedly, and although it was moving through in the tide at a fair rate of knots (between the pauses in Kev’s subtle ‘walk the dog’ action) the culprits eventually revealed themselves in the form of a rather large garfish. Another first from the shore on a lure for Kev. This chunky garfish was also well received. By now the heat was beginning to subside and the tide was at the point whereby we needed to move. Following a rather sweaty ½ mile yomp along the coastal path we arrived at the scene of the previous evening’s exploits. First cast, a crash on the surface and he’s only gone and done it again! It was wonderful sharing Kev’s experience of these catches. And as I mentioned in my previous blog, he’d invested a lot into these sessions, so he thoroughly deserved his success. Although this bass wasn’t big (around 2lb) it fought like a tiger and brought a lot of pleasure to its captor. I even managed to film a decent Go-Pro video of it being returned in the gin clear water. 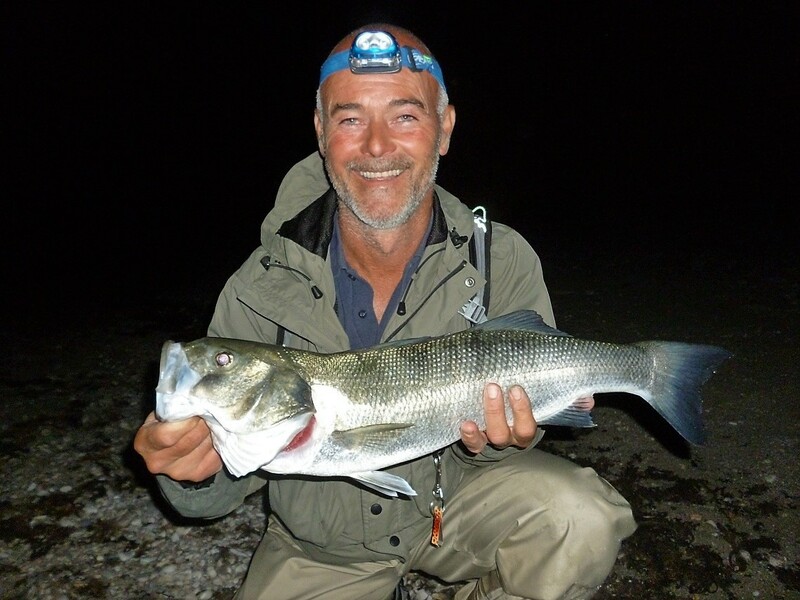 Safely in the net, this cracking bass nailed the ‘Bear King’ in classic style – a swirl, splash and then battle commenced. Kev remarked many times how impressed he was with the battling qualities of a bass. I was hoping the floodgates would open and that Kev would land a few more, but it actually went rather quiet towards dusk. I’ve no doubt the bass were very preoccupied with the movement of the bait fish and despite a couple of lure changes and a few suicidal mackerel to keep us busy, no futher bass were caught. With a slightly later high tide, the conditions were even more perfect than last night to catch a bass in darkness. Clear water, the sea as flat as a pancake, hardly any wind to speak and a half-moon (I like some ambient light) everything looked positive and just ‘right’. Added to Kev’s new found confidence in this method neither if us could contain our excitement! Down on the mark (the scene of the previous evenings’ 5 pounder) the anticipation was already wrecking us both as I rigged a 6″ white senko onto Kev’s lure clip. The sea was so calm it warranted using these subtle lures initially, especially considering the moonlight that was becoming brighter by the minute. A white senko rigged on an Owner 6/0 weedless ‘twistlock’ hook – innocous, subtle, yet lethal! The tide had about 30 minutes to reach it’s peak and Kev had already received a couple of ‘hits’ and ‘taps’ from smaller fish during the 45 minutes he had been patiently casting, and retrieving these very innocuous looking lures. He’d been doing everything as briefed – let them flutter, slow retrieve them, speed it up, the odd twitch, practically ‘wake’ them on the surface – everything to mix it up in order to induce a positive take. And then it happened. ‘Look at that, look at that – BANG!!!SPLASH!!! blimey, this could be big!!! The lure was no more than 8m from beach, literally just under the surface (as Kev was winding quickly on this retrieve) when in the moonlight, we made out a disturbance coming from right angles to the lure – it really was like a torpedo homing in on a U-boat!! We actually saw (and this will live with us both forever) the bow wave of the fish as it raced towards the lure, and where the two met there was an almighty splash as the rod lurched over and the drag began to screech, and screech – this fish was taking serious line and was clearly pretty p*****d off at being hooked in around 18″ of water. The bass did everything it could to shake the big hook – running parallel, towards us, straight out (I had to tighten the drag three times for Kev), it was probably the hardest I have ever seen a bass fight, lasting over 5 minutes. The bass just did not want to give in and Kev had to utilise every ounce of his previous experience of catching trout (and sharks!) to land it. He did a fantastic job of keeping a modicum of control when the fish was running hard, but in those vital last few seconds of the battle as the bass neared the shingle, he excelled. Tired but extremely satisfied! This 63cm bass put up one hell of a scrap. Subsequently, it took around 20 minutes of supporting it in the water and washing oxygen through its gills before she it eventually cruised off into the depths. Kev fished on for another hour with the white senko and a needlefish, but with no further action, and a 4 hour session planned for the next morning, we retired for the evening. The ‘Bass Gods’ had been good to us, we were both weary from the excitement and the heat of the day. The following morning dawned on a similar note to the previous few days – warm, sunny but with a slight swell therefore, a different stretch of coastline beckoned. This area held shallower water and encompassed a multitude of coves, gullies and weed beds that would see Kev fishing 2 hours either side of high water with primarily, soft weedless plastics and small surface lures. Kev’s third and final session of his 3 day bass fishing holiday ended fishless however, it enabled him to fish with subtle weedless soft plastics – something he enjoyed and ultimately, is another string to his bow. The amount of bait fish in and around the rocks was staggering – literally thousands and thousands. And if the bass had noticed them and appeared in one of the coves we were covering we would have been in for a real treat. But despite casting and retrieving along a half mile stretch, moving constantly, especially as the tide ebbed, it just wasn’t to be – the bass were simply elsewhere. 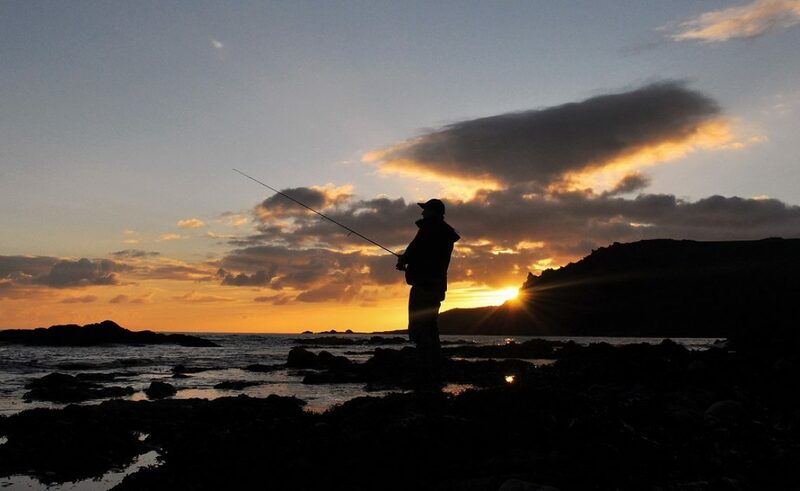 Kev had arrived in south Devon very open to everything associated to bass fishing – his main objectives were to learn, relax, enjoy himself and hopefully catch a bass (although he totally understood there were no guarantees). Subsequently, I believe he achieved all of his aims during what was also a wonderful period of weather – he couldn’t have picked a better couple of days to be honest! Moreover, when you consider Kev had never caught a bass from the shore on a lure, to then catch them on surface lures, shallow diving minnows and weedless soft plastics in daylight, darkness and all in very different scenarios, is something that will hold him in good stead for the future. Thanks for a fantastic weekend. I learn’t so much in one weekend from you. I am so greatful for the knowledge you shared with me. I was very impressed with your patience and having you right next to me giving great advice was reassuring. It gave me confidence to cast in areas I would not normally fish and in ways I have never fished before. I loved using all the lures that I have purchased and catching on them. Knowing how to use new lures will save me valueable time on my solo trips instead of learning the hard way. Learning to identify potentially good places to fish was also an added bonus. You have given me much food for thought. First night was an absolute blast and very exciting. Loved every minute of it and I will be back for more sessions. To anybody reading this, make a date with Marc. You will not regret it. Next Client Catches – Wet and wild bassing!